While it's true that cloud computing infrastructure is often primarily deployed to enable an IT organization achieve a business agility goal, there's always the expectation that an operating cost reduction will also be the outcome -- as a direct result of cloud service adoption. In particular, the tier-one hyperscale public cloud service providers are able to influence Line of Business leaders by demonstrating how they can offer limitless access to more IaaS resources for a lower cost. This trend continues to raise the bar of expectations for CIOs that currently rely upon legacy IT infrastructure. Make no mistake, the competitive cost assessment of IT services will likely remain a constant KPI -- used as a peer-group benchmark test that's applied to the performance evaluation of every CIO and IT manager in a large enterprise. According to the latest Cloud Price Index from 451 Research, while on-demand pricing has fallen only slightly at 2.25 percent since October 2014, it is nowhere near matching the 12 percent reduction achieved by those enterprises that negotiate and commit. Using 451 Research's cloud pricing model, representing a typical multi-service on-demand application, the cost is now $1.68 per hour -- in October 2014, the cost for the equivalent basket of cloud services was $1.72. Revealing the extent to which cloud service providers encourage commitment to help them plan capacity and ensure capital for infrastructure investment, 451 Research's best-case price indicator is only $0.95 -- that's a significant 44 percent savings compared to on-demand. The best-case price measures the same application used the same way as on-demand pricing, but takes into consideration negotiation, subscriptions, reserved instances, term commitments, and sustained-use discounts. Although the Cloud Price Index shows compute pricing has fallen by 4 percent and bandwidth has come down 3 percent, cloud computing service providers are enjoying increased revenue and profits from other services -- such as cloud management, PaaS, data and storage pricing, which have remained static over the same period. "If you believe the hype, public cloud providers are in a cutthroat price war and race to the bottom, where margins are being slashed, and profitability is at risk," said Dr. Owen Rogers, senior analyst at 451 Research. According to Rogers' assessment, the reality is there is no cloud price war. There are battles being fought over certain cloud services -- particularly compute, where providers are seeking publicity and market share in return for price cuts. But cloud providers are more than just compute -- considering 50 percent of the typical Web application's cost relates to cloud databases, it's easy to see how sales of more value-adding services can offset declining margins on basic IaaS services. 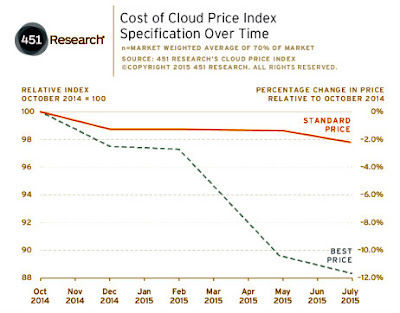 "Cloud has no bottom price," Rogers adds. "Even if infrastructure is eventually given away for free, as long as the provider sells other services, which offset this loss, then it can still be a profitable business."